As AASL President Audrey Church notes: “Intellectual freedom and the right to privacy have been with us throughout the history of school librarianship. The issues are the same, but the formats, the situations, and the contexts have grown” (qtd. in Adams, 41). During Banned Books Week, every school librarian has the opportunity to involve students, colleagues, administrators, and families in projects related to the Freedom to Read (http://ftrf.org). Celia Muniz is the library media specialist at Harlingen High School in Harlingen, Texas. 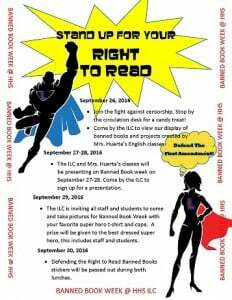 She created a flyer to spotlight her school’s week-long observance of Banned Books Week. 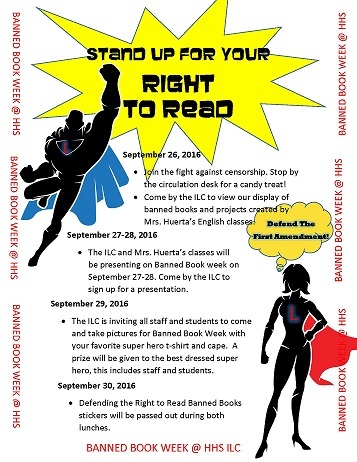 On Tuesday and Wednesday, Mrs. Huerta’s students and the ILC offered Banned Books Week presentations to other classes on a sign-up basis. Today, on September 29th, Ms. Muniz is taking photos in the ILC of staff and students wearing super hero t-shirts and capes. Finally, on Friday Ms. Muniz is distributing “Defending the Right to Read Banned Books” stickers in the cafeteria during both lunch periods. Similarly, Erikka Adams, head librarian at the Proctor Academy in Andover, New Hampshire, set out to involve the entire campus in Banned Books Week. She created a school-wide, campus-based banned books scavenger hunt, which she kicked off with a school-wide announcement. She followed up the announcement with details via email. All of the banned books in the hunt had a sheet inside explaining why they are banned and a QR code to a video talking about banned books in general. She posted the scavenger hunt clues on the library’s social media accounts; students and faculty had to follow/like/friend to get the clues. Anyone who finds one of the challenged books, snaps a selfie holding the book, and posts the photo using these hashtags (#bannedbooksweek #proctoracademy #proctorreads) will be invited to the post-banned books book swap and pizza party. Finally, during a school-wide assembly, some students will share the title of the books they found, why each has been banned or challenged, and how students found that particular copy. In collaboration with advisors and subject area teachers, Ms. Lewis opened a discussion with the entire middle school community. There has been a “pop-up” library with banned books and poster-making materials in the middle school lounge during lunch over the past few weeks. The school’s book clubs have dedicated their opening meetings of the year to exploring banned books, censorship, and the freedom to read and think for themselves. In addition, Ms. Lewis has been speaking about intellectual freedom with ELA and advisory classes. Last Thursday, she spoke with one grade level as a whole group during Drop Everything and Read time. After students were introduced to the issue of intellectual freedom, they were encouraged to participate in a variety of activities including making a poster, taking a “banned book shelfie,” participating in a virtual read-out, and reading diverse banned books. Ms. Lewis created this presentation to support this call to action. Seanean Shanahan, who shared Banned Books Week activities in Monday’s “Freedom to Read” blog, snapped photographs of ELA teachers wearing their “I Read Banned Books And I Cannot Lie” t-shirts. Involving classroom teachers, staff, and students in these week-long projects is one way for Ms. Muniz and the Harlingen High School ILC, Ms. Adams and the Proctor Academy Library, Ms. Lewis and the UNIS Library to diffuse conversations and learning about censorship and First Amendment rights throughout their school buildings. Brava to these four leader school librarians. If you have questions about their work, you can contact Celia Muniz (@celiamuniz2), Erikka Adams (@LovetheLovejoy), and Seanean Shanahan (@Librarytalker) using their Twitter handles. And hurray for all of the school librarians who remain defenders of students’ intellectual freedom. Adams, Helen. “65 Years and Counting: AASL and School Librarians—Still Champions of Intellectual Freedom.” Knowledge Quest, vol. 45, no. 1, 196, pp. 34-41. This week school librarians across the U.S. are collaborating with classroom teachers to promote students’ freedom to read. In many school libraries, librarians have put up displays that spotlight challenged books; many are leading students in discussions about censorship. This Pinterest “Banned Books Week” search yields photographs of many such displays. While displays are important, they can isolate students’ questions and discussions about their Constitutional freedom to read in the library. Other school librarians are involving their faculty in order to diffuse these conversations throughout the building. While all of the shirts started the same, they ended up very different. The ELA teachers agreed to wear their shirts on the first school day of Banned Books Week, today, Monday, September 26, 2017. Seanean hopes to snap a photo of the group wearing their personalized “I Read Banned Books And I Cannot Lie” shirts. Last year, Seanean asked classroom teachers to volunteer to wear cards around their necks that had the picture of the cover of a banned book on one side and the reasons, locations, and years those books were banned or challenged on the reverse side. They wore the cards around school for the week and many of the teachers started trading them around. You can reach Seanean on Twitter @Librarytalker if you have questions about her efforts to support students’ understanding of their Freedom to Read. How are you leading and involving your learning community in #bannedbooksweek? 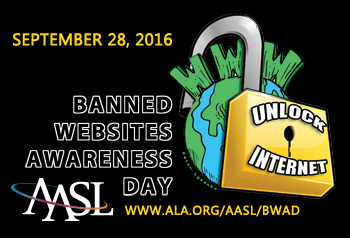 Librarians across the U.S. will be recognizing “Banned Websites Awareness Day” (BWAD) on 9/28/16. Working toward unrestricted access to information and resources should be one of librarians’ top priorities. Choice in checkout helps students (yes, even kinders) practice a lifelong learning strategy. Internet filtering and blocked Web sites and social media are an on-going challenge in many schools and libraries. Children’s Internet Protection Act (CIPA) was passed in April, 2001, in order to address concerns about children’s access to obscene or harmful content over the Internet. Just as school library policies can minimize the frequency of book challenges, policies can also mitigate complaints regarding Web-based information. ◾Measures restricting minors’ access to materials harmful to them” (FCC). While protecting children and youth from obscene and harmful information is essential, overly restrictive filtering software may prevent young people from accessing information that is important to their health, wellness, and intellectual growth. School librarians, in particular, may frequently be in the position of advocating for a particular educational website to be unblocked. The wise school librarian makes friends with the IT department and helps to educate administrators about the importance of students having opportunities to practice digital citizenship. If students are to become responsible, informed digital citizens, they must be given guidance as they develop skills to evaluate information. They must learn to use social media venues in an environment in which they are accountable for their communications. School librarians in collaboration with classroom teachers can provide youth with learning experiences so they can explore, evaluate, and responsibly use Web-based information and tools. As AASL notes, “Relying solely on filters does not teach young citizens how to be savvy searchers or how to evaluate the accuracy of information” (BWAD Background). What are you doing in your school to recognize BWAD? American Association of School Librarians (AASL). “Banned Websites Awareness Day.” ALA.org. http://www.ala.org/aasl/advocacy/bwad. Accessed 21 Sept. 2016. American Association of School Librarians. “Banned Websites Awareness Day Background.” ALA.org. http://www.ala.org/aasl/advocacy/bwad/background. Accessed 21 Sept. 2016. Federal Communications Commission. “Children’s Internet Protection Act.” FCC.org. https://www.fcc.gov/consumers/guides/childrens-internet-protection-act. Accessed 21 Sept. 2016. Articles in the September issue of Educational Leadership offer strategies and a great deal of support for nurturing relationships with students. But to be honest, I was disappointed when an issue titled “Relationships First” did not address the relationships between and among adults in school learning communities. Student-educator relationships are formed and informed within a school culture. In a collaborative culture school in which building trust through relationships is a norm, all relationships benefit from working within a system of support. All ten of these tips could also be accomplished by a school principal and school librarian team. If school principals see their school librarian as a coleader in creating a culture of collaboration, they may increase their odds of achieving their desired goal—a positive school culture. Under Tip #4 “Twitter videos of awesome things that are happening in classrooms,” Mr. Couros reminds principals to “make sure you share what you see with others constantly and consistently.” From the school librarian’s perspective, make sure you share what you do with other educators. When you make others the star of your story, you put a spotlight on their achievements—a great way to build collegial relationships. The same can be said of school librarians. Approaching others with an open heart and helping hand and being approachable by others is one hallmark of an effective school librarian. School librarians who don’t reach out and stay in the library are simply not as visible as they need to be. Take time to get out of the library. Take time to meet formally and informally with all members of your learning community. Show that you care for your adult colleagues as well as for the students and families who are your shared responsibility. Take time for collegiality and co-create an optimal work environment for yourself as well as for others. Couros, George. “Ten Easy Ways to Create an Amazing #SchoolCulture as a Principal This Year.” GeorgeCouros.com. 27 Aug. 2016 Web. 14 Sept. 2016 <http://georgecouros.ca/blog/archives/6627>. Geralt. 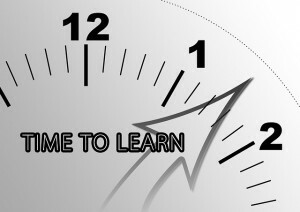 “Time to Learn.” Pixabay.com. 13 Aug. 2014. Web. 14 Sept. 2016 <http://pixabay.com/en/learn-clock- clock-face-time-hours-415341/>. One way to make professional connections and build relationships with our colleagues is to read what they are reading. Many school principals are members of ASCD, formerly the Association for Supervision and Curriculum Development, and receive the Educational Leadership magazine. “Relationships First” is the theme of the September 2016 issue. Since school principals’ perceptions of and support for school librarians is critical to the success of school library programs, I look forward to reading this magazine when it arrives monthly in my mailbox. (Even if you aren’t an ASCD member, you can access a few articles and the columns online for free: http://www.ascd.org/publications/educational-leadership.aspx). Educator and researcher Carol Ann Tomlinson’s column in the magazine has been one of my touchstones for many years. This month in “One to Grow On” she wrote: “Fox Taming and Teaching: The Little Prince offers a lesson on building relationships.” I was delighted to read that Dr. Tomlinson and I share a favorite book: Le Petit Prince/The Little Prince by Antoine de Saint-Exupéry (1943). In fact, I quoted from the same passage in the book on the dedication page of my dissertation. In this part of the story, the Fox is sharing his wisdom with the Little Prince, who has grown fond of a rose. The Fox tells the Little Prince that: “It is the time you have given to your rose that makes your rose so important.” The investment of time, energy, care, and attention that we give to other members of our learning communities is the mark of their value to us. While the order of the books on the library shelves and empty book carts help students, classroom teachers, and librarians find materials more easily, it may be the time we take to listen to a student’s, teacher’s, or administrator’s story that is the most important thing we do on any given day. This time of year when the stores begin displaying large bags of Halloween candy, I think of the mini dark chocolate candies that I always kept in my library office drawer. Offering a sweet treat can be an icebreaker. It can be a way to connect with others, to share a success or express empathy, and to start a conversation. How do you show that you value relationships in your daily work? How do you want others to “see” you and how would they describe the feeling tone of the environment you co-create in your school library? de Saint-Exupéry, Antoine. The Little Prince. San Diego, CA: Harcourt, 2000. Print. In early August, Elyse S. Scott posted “On the Very First Day (Be the Best You Can Be)” to the MiddleWeb blog. Whether or not you teach at the middle school level, her words of advice are important for all educators: “Those initial days in the classroom can be the catalyst for building community and ultimately a collaborative learning environment, and it all starts with that first impression!” (Scott). Building student-educator relationships is an essential foundation for learning. Regardless of our age, we all learn best from people we respect and teachers who “see” us—recognize who we are and what’s important to us. We all can remember teachers who made an impression on us because they shared who they were as people. They sang a song or recited a poem they wrote (as Elyse Scott does). They told a funny story or shared something about their lives outside of the classroom that we remember to this very day. Memorable (and effective) educators share their hopes and dreams. They show their students their humanness. Sharing who we are and showing our humanity is equally important for school librarians as we reach out to get to know our classroom teacher colleagues. Whether we or they are new to the building, returning after a leave, or simply returning from summer break, we should always extend the hand of friendship. 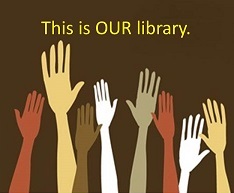 While it is de rigeur for school librarians to share the children’s and young adult books that we love, sharing an adult read, film, or theater performance that we enjoyed may give our colleagues more clues about who we are. Telling a funny story about our own children or the misadventures on a trip we took over the summer can show our foibles and make us more approachable to our colleagues. When we show a genuine interest in our colleagues’ children as well as in their students we can connect more deeply with the educators with whom we seek to establish instructional partnerships. As you get into full swing this school year, take the extra few minutes to connect with individual colleagues as well as individual students. Share yourself and encourage others to share who they are with you. And please don’t forget to make those essential connections with your principal(s), too. Párraga, Rafael. “Footprint Sand Beach Foot.” Pixabay.com. N.p., n.d. Web. 8 Sept. 2016 <http://goo.gl/6gDjk2>. Schubert, Franz. VeryBestQuotes.com. 15 Apr. 2013. Web. 8 Sept. 2016 <http://goo.gl/hbMyiE>. Scott, Elyse S. “On the Very First Day (Be the Best You Can Be).” MiddleWeb Blog. 9 Aug. 2016. Web. 8 Sept. 2016 <http://www.middleweb.com/31784/on-the-very-first-day-be-the-best-you-can-be/>. I have just moved back to my full-time home in Tucson, Arizona. Although the unpacked moving boxes are annoying, rearranging my life has had its benefits. One of them is reassessing the books on my shelves and pondering the limited space I now have for hard copy books. In my bookshelf explorations, I came across a photo album that included some of my fondest moments as a practicing school librarian. One of them was taken at Gale Elementary School in Tucson (circa 1998) when I offered a “thundercake” beginning of the year social event for classroom teachers and specialists. In Arizona, the new school year begins toward the end of the summer monsoon rain season. 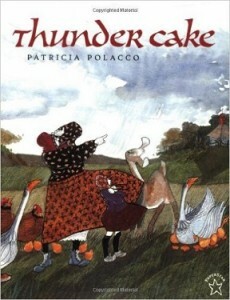 The connection to Patricia Polacco’s book gave me the opportunity to share the story and my hopes for the “ingredients” that would make our school program a success that year. During the social time, I encouraged my colleagues to share their hopes and dreams for the upcoming year. Of course, I displayed new books and resources, but most importantly I reached out to build relationships with my colleagues. Thanks to Patricia Polacco’s book and “thundercake” recipe, I offered a tasty invitation to increasing collegiality as a foundation for future classroom-library coplanning and coteaching in the new school year. The first few weeks of a new academic year are an ideal time to focus on building relationships. If you haven’t yet invited your colleagues into your school library for a social time, consider baking a “thundercake” and talking with them about how you can work together to create exciting and effective learning experiences for and with preK-12 students this year. Polacco, Patricia. Thundercake. New York: Philomel, 1990. Print. 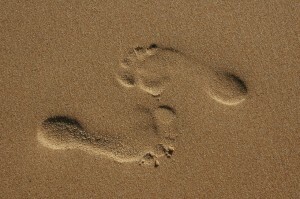 Note: Welcome back to the Building a Culture of Collaboration® (BACC) Blog. Over the summer months, changes in the co-bloggers life commitments have resulted in the blog becoming, at least for the time being, a solo activity for me, Judi Moreillon. I will miss reading the ideas, thoughts, and questions posed by my BACC colleagues.